Many Pakistanis believe he is – there seem few other credible explanations as to why he was going around Lahore with a Glock pistol in a car with local number plates without informing local authorities. 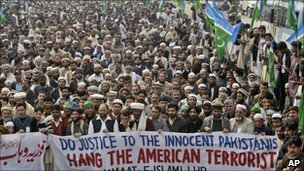 It is a requirement for embassy staff – especially those from Western embassies – to inform local police of their movements, simply because they are prime targets for militants in Pakistan. 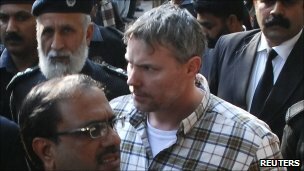 Mr Davis’s department in the US embassy is widely seen in Pakistan as a cover for Central Intelligence Agency (CIA) operations. Mr Davis himself said he was a consultant employed by the US government. Researchers in the US say that since leaving the military, Mr Davis worked for a security firm called Hyperion LLC. But subsequent investigations by the US media have now shown that Hyperion exists only as a website. The offices that the company says it has in Orlando have been vacant for several years and the numbers on its website are unlisted. Maybe. It all depends on how eager the Pakistani authorities are to punish him. The fact that he is possibly a spy does not mean he is not covered by diplomatic immunity. It is common practice for intelligence services across the world to send operatives under the cover of assignments to embassies. Both Pakistani and US “diplomats” have been caught in such situations – and every time have been asked to leave the host country immediately with no possibility of a return. That is the maximum punishment that has been levied in the overwhelming majority of cases in countries which have signed the Vienna Convention. However, in some countries there are exceptions for serious offences committed, such as murder. Pakistan is one of those countries. The matter is now in the hands of the judiciary. But it is important to remember that Mr Davis has been charged with murder – the maximum sentence here is the death penalty. That was the initial plea made by Mr Davis and the US embassy. However, subsequent investigations by the police, forensic labs and the local and international media suggest that the two men were driving away from Mr Davis when they were shot. In February Lahore’s police chief said that Mr Davis was guilty of “cold-blooded murder” – he said that no fingerprints had been uncovered on the triggers of the pistols found on the bodies of the two men. Furthermore he said that tests had shown that the bullets remained in the magazines of their guns, not the chambers, suggesting they weren’t about to shoot him. On the face of it, this leaves Mr Davis’s claim that they were robbers – with one even apparently cocking a gun at his head – looking very thin. In addition, police say ballistics evidence shows that the pair were shot in the back – which again suggests they were moving away from Mr Davis, rather than about to attack him. A side event to the main drama concerning Mr Davis was the fact a third man was also killed during the incident. He was an innocent bystander run over by a US embassy vehicle, which was initially said to have arrived to rescue Mr Davis. The fact that an embassy vehicle was able to get to the spot so quickly was a source of astonishment to anyone who is even vaguely aware of the geography of Lahore. Given the incident was over within minutes, it seems incredible that anyone could negotiate the 12km (7.4-mile) 40-minute drive in peak traffic in less than five minutes. But subsequent investigations have now shown that the second car – a Toyota Landcruiser – was with Mr Davis at the time of the incident. In fact, according to eyewitnesses, Mr Davis was leading and clearing the way for the Toyota when the incident took place. In the light of what happened afterwards, it seems Mr Davis was in “protective mode” and opened fire to “secure” whoever or whatever was in the Toyota – the interior of this vehicle was not visible as its windows were tinted. It is evident in local TV footage that the second vehicle is going away from Mr Davis at the time of the incident. As it disappears into the dust, Mr Davis calmly pulls over and gives himself up. Pakistani authorities have asked for the Landcruiser and its driver to be handed over – a request with which the US has yet to comply. Raymond Allen Davis is a ruthless and brutal American terrorist who had murdered two innocent Pakistani men in cold blood and this horrible murder caused the death of an innocent Pakistani woman. His American accomplices also murdered an innocent Pakistani man on the same day. The 1963 Vienna Convention allows Pakistani police to arrest the murderers because they had commited grave crime against innocent Pakistani people. The terrorist, immoral and ruthless US regime has exposed itself as the protector of criminals by asking the Pakistani government to release the murderer. Only criminals support a criminal.